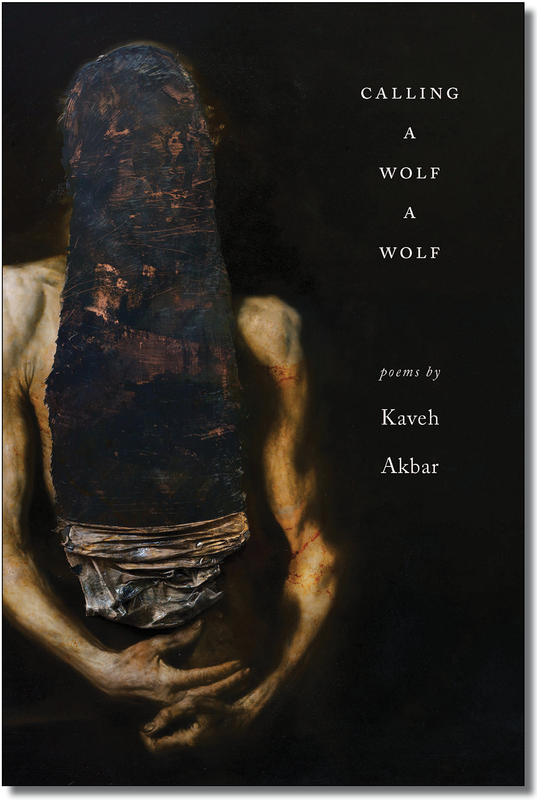 To read Kaveh Akbar’s debut full-length collection, Calling A Wolf A Wolf, is to see a human turned inside out, body and soul, rendered skillfully on every page. Akbar’s poetry deftly navigates the complicated subjects of religion, addiction, and loss—of the body’s health, of self, of faith—and the complex joy and wonder at their being found again, if they can be found at all. These poems are seekers in themselves, journeying through alcoholism and recovery, faith and faithlessness, scrubbing unabashedly at the fogged window of the self. In “Soot,” the final poem before the book breaks into sections, Akbar writes, “Upon landing, the ground / embraced me sadly, with the gentleness / of someone delivering tragic news to a child.” This is how we arrive at Akbar’s work: the truth of them often unbeautiful, often raw with the strange griefs of if and want and need, and us readers serving as the child; the poems a kind of tragedy, offered to us with Akbar’s careful elegance. The confessional takes a subtle but powerful turn in this final section, made more poignant by the preceding poems in “Hunger.” Instead of a straight lamentation of loss, the speaker of these final poems embraces the failures noted in the poems prior, not necessarily as “jewels” but as scars to place the new jewels he’s gathering into, a way of accepting the old self as a part of the new, becoming a whole. It isn’t that this weaving of selves in celebration of the past; there are still moments of despair, regret, of broken-down love (“I finally have answers to the questions I taught / my mother not to ask but now she won’t ask them”), but that love is beginning to heal, and turn inwards, oftentimes even towards the itch of addiction itself. This is best evident in “Portrait Of An Alcoholic With Craving,” in which the speaker has “lost the unspendable coin” that protected him from cravings, but goes on to say that though it keeps him up at night, he doesn’t mind, because “often / the tune is halfway lovely. Besides, if I ask you to leave / you won’t. My hands love you more / than me.” Even in the final poem, the love hurts, but is hopeful: “The boat I am building / will never be done.” No, it won’t ever be finished, but that’s no reason to stop building. RAYE HENDRIX earned her BA and MA in English from Auburn University and is an MFA candidate at the University of Texas in Austin. Her poetry has appeared in or is forthcoming from Rattle, Southern Indiana Review, Shenandoah, The Pinch, Cherry Tree, The Adirondack Review, and elsewhere. Calling a Wolf a Wolf. By Kaveh Akbar. Alice James Books, 2017.